Sound of the Human Tanks has 90 tracks totaling 178 minutes of game music featuring tracks from the first two games in the 'Human Tanks' series, 'War of the Human Tanks' and 'War of the Human Tanks - ALTeR'. 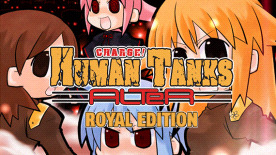 Human Tanks - ALTeR is the second instalment of the War of the Human Tanks series, and sequel to War of the Human Tanks. This time you assume command of the enemy of the first game, the Royal Army, and fight back for all you hold dear!